Home / News / Joranalogue range now in stock! Joranalogue range now in stock! We are excited to announce that we now have the full range of Joranalogue modules in stock. These are superbly designed, well engineered…and beautifully realised products. They may be utilitarian at first glance, but look a little deeper to find hidden depths in terms of creativity and flexibility. 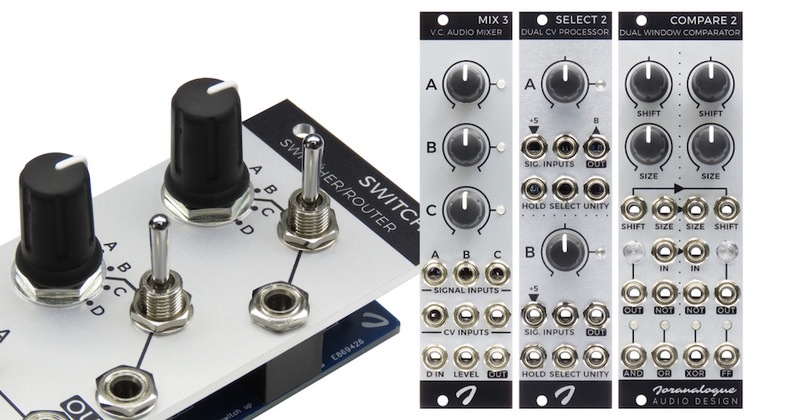 Mix 3 – Three channel DC-coupled voltage-controlled mixer, with signal boost, optional line out setting & more..
Switch 4 – Hands-on signal switching and routing solution for your Eurorack modular synthesiser. Previous post: XAOC Devices restock just in – BATUMI, BELGRAD, SAMARA, TALLIN & more..
Next post: Pittsburgh Modular Lifeforms range now in stock ..including new PRIMARY OSCILLATOR!